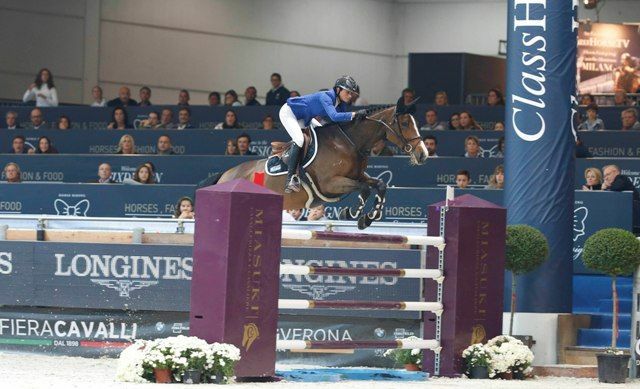 Home Equestrian News Leprevost and Nice Stephanie win Premio Prestige. Leprevost and Nice Stephanie win Premio Prestige. It was the French national anthem that brought the first day of Jumping Verona 2014 to a close when Penelope Leprevost claimed the honours in the 1.55m Premio Prestige with Nice Stephanie. (Photo © jumpingverona). In a thrilling 12-way jump-off against the clock, the 34-year-old rider who lies 12th on the Longines World Rankings produced a breath-taking performance from her 10-year-old mare, and it was Sweden’s Rolf-Goran Bengtsson who finished in runner-up spot with the stallion Clarimo Ask while Bart Bles and Lord Sandro lined up third for The Netherlands. With so many of the world’s leading riders qualified for the timed round this was never going to be an easy one to win, and Leprevost really put it up to the rest of them when, third to go, she threw caution to the wind to return her second clear of the competition in 37.69 seconds. She was fearless from the outset, and her gallop from the penultimate Longines oxer to the final water-tray vertical drew gasps of amazement from the spectators, Nice Stephanie answering her every call with the courage of a lioness. Bengtsson was next into the ring and set off the with his grey stallion who found it hard to contain his excitement but stopped the clock on 38.45 seconds. And he held onto second spot despite a great run from Bles who crossed the line just 0.07 seconds slower. The Dutchman said afterwards he lost a vital second on the turn from the vertical third fence to the first part of the double at four. “I landed too far forward and couldn’t make a tighter turn, but I’m really pleased with the way my horse jumped today” said the 34-year-old who is based near Arnhem in Holland. Leprevost said tonight that she really didn’t expect to win, but she knew her mare is brave. “She’s only 10 years old but she has a great attitude” said the rider who was a member of the silver medal winning team at the Alltech FEI World Equestrian Games™ on home turf in Normandy in September. Final Results €60’000 Premio Prestige 1.55m. Previous articleAllen and Wild Thing race to victory for Ireland. Next articleDe Luca Makes it an Italian Hat-Trick.